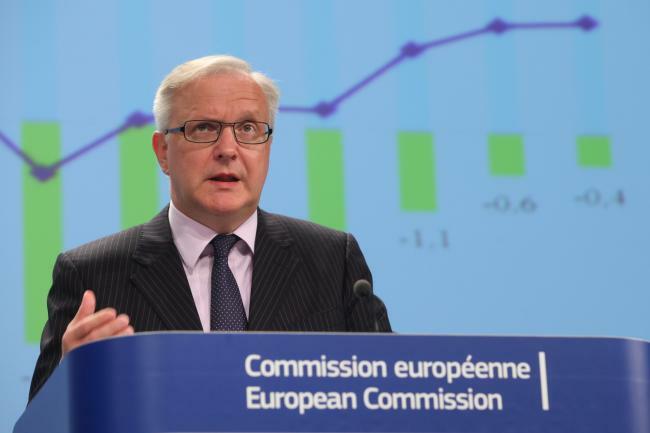 Press conference by Olli Rehn, Vice President of the EC in charge of Economic and Monetary Affairs and the euro on the autumn economic forecast for 2012-2014 for Gross Domestic Product (GDP), inflation, employment and public finances. (EC Audiovisual Services). The downward trend of Eurozone inflation was confirmed yesterday by Eurostat, the statistical service of the European Union. According to this source “Euro area annual inflation was 2.2% in December 2012, the same as in November. A year earlier the rate was 2.7%. The EU27 annual inflation was 2.3% in December 2012, down from 2.4% in November”. It goes without saying that the falling rate of change of consumer goods prices reaffirms in the most formal way that Eurozone and along with it the EU27 economy was in recession during the last months of 2012. The good news is that as from the beginning of this year economic analysts predict that the Eurozone economy will return to a weak growth path but inflation will continue to fall towards the 2% benchmark and even below it. Of the same opinion appears to be also the European Central Bank. Last week the governor of ECB Mario Draghi estimated that the 2013 inflation rate will fall even below the two per cent benchmark, which is considered as appropriate for Eurozone’s economy, and consequently there will be no need for measures to be taken in this front. In detail Draghi said last Thursday that, “HICP (Harmonised Index of Consumer Prices) inflation rates have declined over recent months, as anticipated, and are expected to fall below 2% this year. Over the policy-relevant horizon, inflationary pressures should remain contained. The underlying pace of monetary expansion continues to be subdued. Inflation expectations for the euro area remain firmly anchored in line with our aim of maintaining inflation rates below, but close to, 2% over the medium term. The economic weakness in the euro area is expected to extend into 2013”. According to Eurostat “in December 2012, the lowest annual rates were observed in Greece (0.3%), Sweden (1.1%), France and Cyprus (both 1.5%), and the highest in Hungary (5.1%), Romania (4.6%) and Estonia (3.6%). Compared with November 2012, annual inflation rose in eleven Member States, remained stable in four and fell in eleven”. Of the main components of overall inflation the highest annual rates in December 2012 were observed in the sectors of alcohol & tobacco (3.6%), housing (3.4%), food and education (both 3.0%), while the lowest annual rates were observed for communications (-3.8%), household equipment (1.0%) and recreation & culture (1.2%). Concerning the detailed sub-indices, fuels for transport and electricity (+0.10 percentage points each) and vegetables (+0.08) had the largest upward impacts on the headline rate, while telecommunications (-0.19), cars (-0.07) and financial services (-0.06) had the biggest downward impacts.